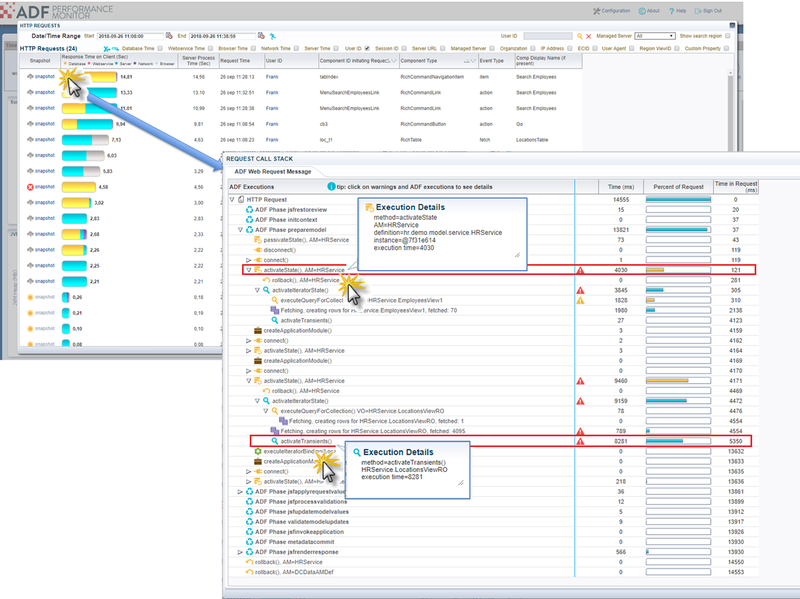 In this blog I will discuss the top 10 typical performance problems I see in general in Oracle ADF projects – and will discuss solutions. 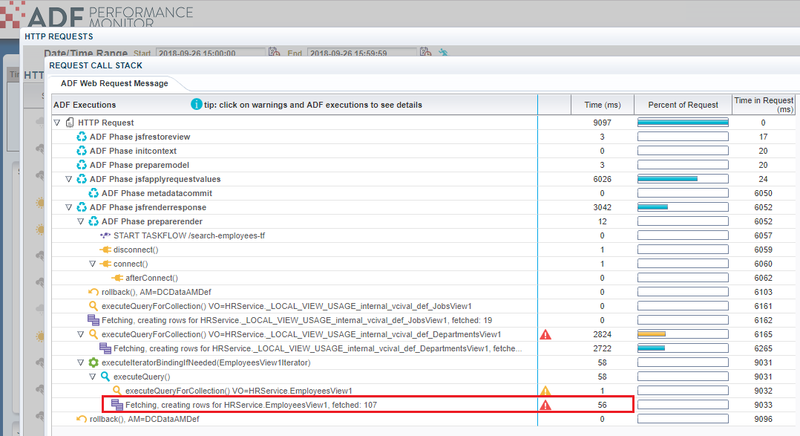 I will illustrate the top 10 typical bottlenecks with ‘ADF callstacks’ – a feature of the ADF Performance Monitor. An ADF callstack, a kind of snapshot of the ADF framework, gives visibility into which ADF methods caused other methods/operations to be executed, organized by the sequence of their execution. 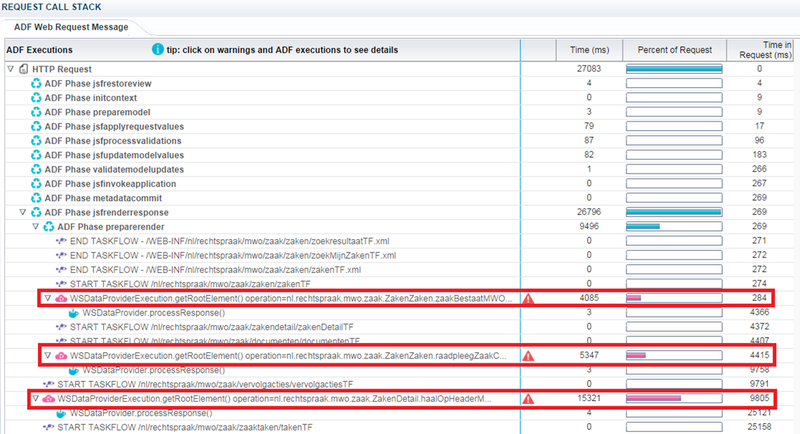 A complete breakdown of the HTTP request is shown by actions in the ADF framework (Fusion lifecycle phases, model (BindingContainer) and ADF BC executions, start & end of taskflows, e.g. ), with elapsed times in milliseconds and a view of what happened when. 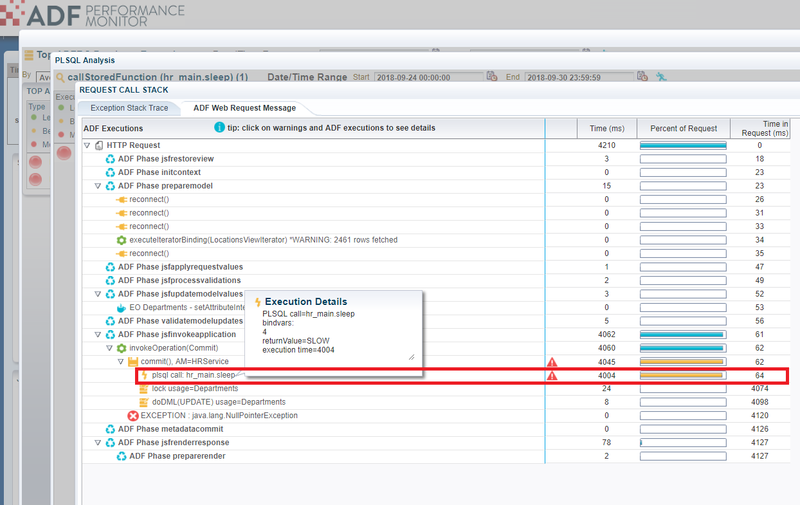 The parts of the ADF Request that consume a lot of time are highlighted and indicated with an alert signal. The number one bottleneck is – as is in many web applications – SQL queries of ViewObjects to the database. This can be caused by many things: the SQL query is written in a suboptimal way, the data model is not efficient, the datasets in the database are far too high, indexes are lacking, indexes are not working as expected, e.g. In this blog is described in detail how you can instrument your ViewObect to get visibility into slow ViewObject queries. A very typical and big bottleneck in ADF is too frequent and too slow ApplicationModule Pooling. ApplicationModule pooling is a mechanism in ADF that enables multiple users to share several application module instances. It involves saving and retrieving session state data from the database or file. This mechanism is provided to make the application scalable and becomes very important under high load with many concurrent users. The default values of ApplicationModule pools are far too small; especially if you have more than 10 end-users. I think this is one of the most important things to tune in general in ADF applications. Activations and passivations are the root cause of many very slow click actions. It is the root cause of errors after incomplete activations. In general, in my experience it is better to try to turn off the whole ApplicationModule pooling mechanism – for so far as it is possible. 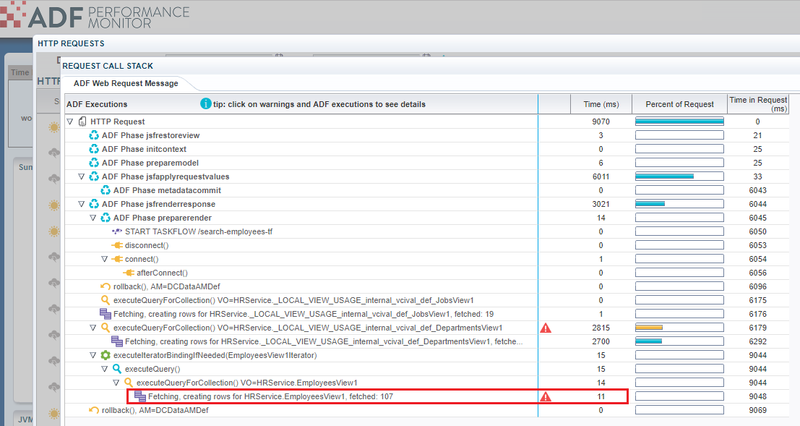 A slow activation of the ApplicationModule called HRService (4030 milliseconds). 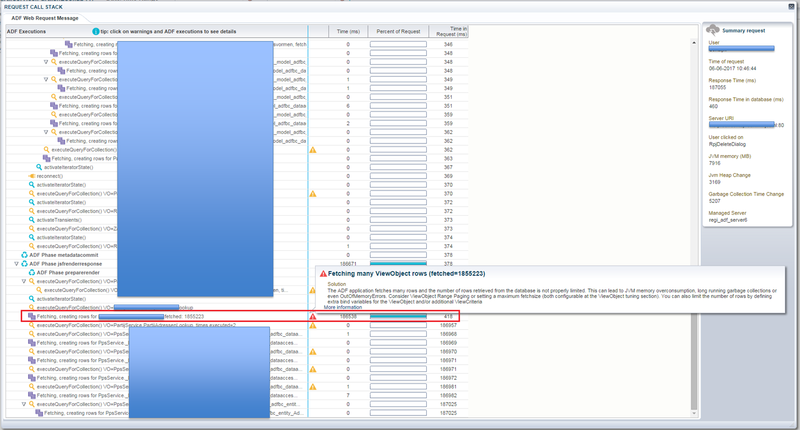 Later in the HTTP callstack we see a more slow activation of the different HRService instance (9460 miliseconds), caused by a slow activation of transient attributes in activateTransients() of ViewObject HRService.LocationViewRO (8281 milliseconds). If you want to know more on ApplicationModule pools and tuning watch the video I made on ADF Performance tuning a few years ago (a big part of the video is on pooling parameters). The default value of the property of Row Level Bind Values on a ViewObject ViewAccessor is true. Set this value explicitly to false if you have no bind variables that really depend other attribute values in the row. This property is meant to set if there are bind variables in the lookup view object that can have a different value for each row. The first time it really executes the query, the second time the framework still calls the method executeQueryForCollection() on the ViewObject. 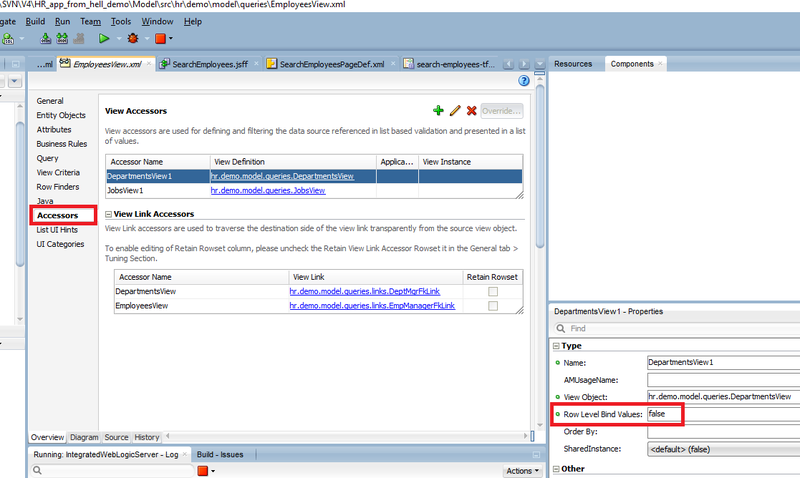 Internally, in the ADF framework, it recognizes that the query already has been executed, and does not execute the query itself to the database again. However, it is still a big inefficiency that for all rows the executeQueryForCollection() method is executed, and internally processed in the ADF framework. As we can see in the example below (callstack metrics of the ADF Performance Monitor in JDeveloper console log), this whole process still takes around 200 milliseconds extra for 35 rows (check the execution timeline on the left). ADF applications potentially use a lot of JVM memory. Many times, the root cause of a high memory usage is that application data retrieved from the database into memory is not properly bounded; too many rows are fetched and held in ADF BC memory. This can lead to memory over-consumption, very long running JVM garbage collections, a freeze of all current requests or even OutOfMemoryErrors. To make matters worse, these rows and their attributes are frequently passivated and activated for an unnecessary long period of time. The solution to this problem can be found in reducing the size of sessions by decreasing of the amount of data loaded and held in the session. Developing a plan to manage and monitor this fetched data during the whole lifetime of an application is an absolute must. It is indispensable to your performance success. The first step is to measure the current number of rows fetched by the ADF application and determine the appropriate maximum fetch sizes for your data collections. You can measure real-time and historically how many rows the ViewObjects load into Java memory with the ADFBC Memory Analyzer. Limit all Viewobjects, that frequently fetch more than 500 rows on a regular basis, with a maximum fetchsize. Or use extra bind variables, add extra ViewCriteria to limit the number of rows. In the screenshot we can see that nearly two billion rows (! ), to be precise 1.855.223, were loaded in the JVM memory of our server. This proces of loading took 186.538 milliseconds (186 seconds). In the screenshot we see a PLSQL procedure call hr_main.sleep() with a bind param value of 4. The whole execution takes 4004 milliseconds (more than 4 seconds). In this case the PLSQL procedure/function is the root cause, not the ADF application code in the ADF application. The problems must be resolved in the database, and can be anything; suboptimal written SQL queries in the procedure/function, the data model is not efficient, the datasets in the procedure/function are far too high, e.g. 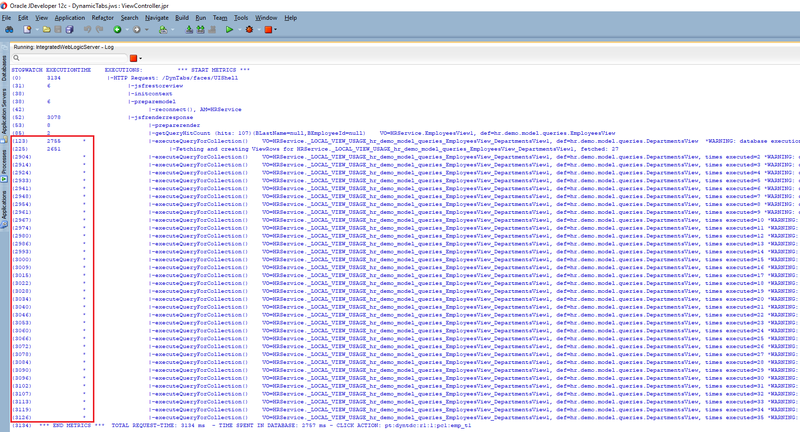 We shouldn’t make our ADF pages too ‘rich’ – we should limit the number of ADF Faces components to some extent. Especially the content of ADF Faces container components. Rendering too many table columns – in combination with sending too many rows to the browser – causes a long browser load time. The same applies to af:listView, af:tree and af:treeTable components with hundreds of rows. But also, other container components like af:iterator – when too many child components are rendered – the browser needs seconds to do the hard work. A page should spent not more than half a second or less in the browser to load. Another way how you can ‘lazy’ load extra columns in a very simple way – and improve the browser load time – is to render columns on demand, for example by showing a show/hide checkbox. Read more on this subject in one of my previous blogs on slow browser load time. Many companies and organizations do have the complete control over which type of browser end-users are using. They have control over it because they have a Citrix environment or internal network where end-users work on. Many times, still Internet Explorer is the only browser that is installed and allowed to use. On the next screenshot we can see in which layer processing time has been spent; database (yellow), webservice (pink), application server (blue), network (purple), and browser load time (grey). In this example from a field report, more than one third of the time spent in is grey, meaning that more than one third of the process time is spent in the browser (!). This is the process time spent by the browser, after receiving the response from the server, to build the DOM-tree and to render/load the content. It turned out that all end-users were using Internet Explorer 11. In the above screenshot we can see three very slow SOAP webservice calls (executed in 4085, 5347, and 15321 milliseconds(!) ). Now the fetch action takes only 11 milliseconds (we win 45 milliseconds). This seems to be minimal, but if you do this on each ViewObject this will be much better the for the performance! 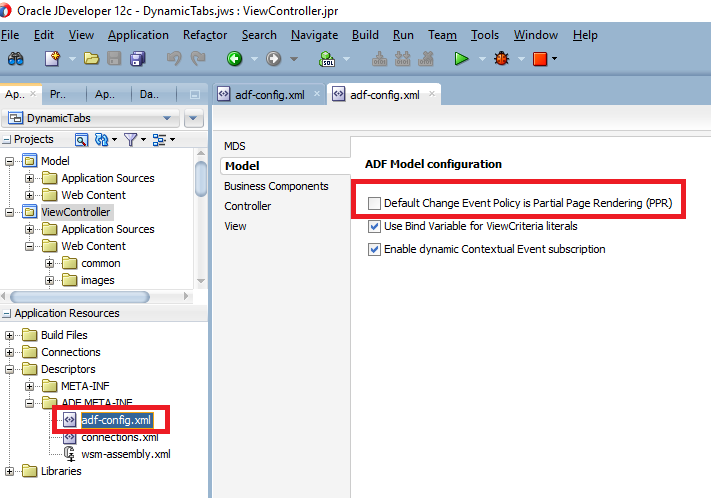 From ADF Release 11G R2 and onwards, the default value is of the global ChangeEventPolicy property is ppr. This is not good for performance, as there is a lot of performance overhead in this property. Too many iterators and components are automatically refreshed on each HTTP request. You better use manual partialTriggers in the page to refresh components. Be aware that if you change it in your current application, you should add the manual partialTriggers and test if everything works. Of course, there are many, many more possible causes of poor performance (not well configured JVM, JVM heap too small, long running JVM garbage collections, slow network, hardware, e.g. ), but these were our top ten typical bottlenecks we see frequently at companies that use the ADF Performance Monitor.